Better understanding of how content drives business objectives at different levels. Establishing a basis for measuring performance is key. It’s a critical cornerstone of any content marketing program, strategy, and/or tactic. When considering the big picture, it can sometimes be tricky to speak to the efficacy of your content marketing program. 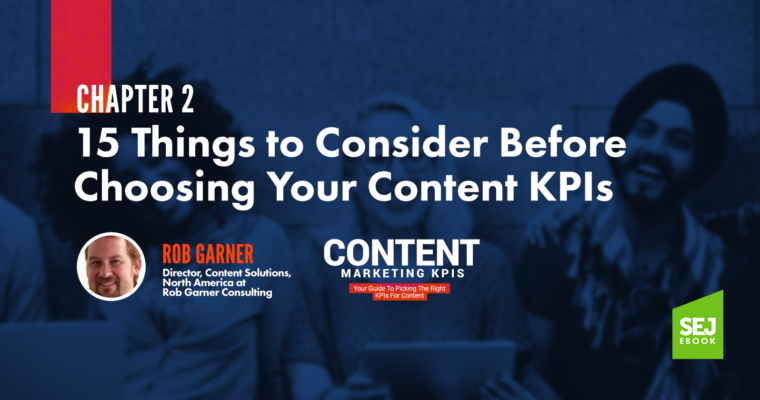 Whether your next baseline analytics strategy is happening right now, next month, or next year, the following 15 considerations should be top of mind when you and your organization think about content marketing KPIs and metrics. Consider each point and ask yourself (and your organization) to address the questions as well. The goal of this exercise is to get a clear picture of your content marketing goals. What are your business objectives at a tactical, strategic, and even logistical level? How does a particular metric or KPI tie into a direct business goal (or goals) and vice versa? How much should the business goal weigh toward the KPI in terms of time spent on analysis and insight? How many business goals are you mapping to content efforts, and is it reasonable given the scope and budget for your program? Establishing KPIs and metrics shouldn’t be a static, one-time event. In order to run an effective program, you should assess data, seek and find insights, discover new parts of the ongoing project, and find new stories within your data to match business goals. KPIs and metrics should be evaluated for relevancy to the program. Being fluid in how you measure results may open up substantial opportunities to expand business goals and performance. Are there any recent findings that would signal new areas, growth, or emphasis in your content marketing program? Have you been using the same KPIs and metrics for three to five years or more? If so, why or why not? 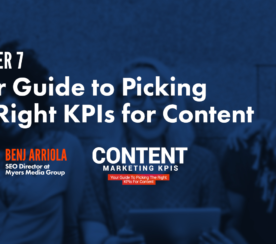 Is it time to add new KPIs and metrics based on changes in your content approach or content marketing spend? When measuring the effects of your publishing efforts, it’s important to distinguish between your on-site assets (such as your website or blog) and off-site assets (areas where you interact but don’t control at the domain level). Remember to tag your off-site assets when appropriate. Measure the overlapping areas as well, such as traffic from social spaces and reciprocation between social and search returns. Are we reasonably connecting on-site and off-site content actions in a way that shows a cause and effect, and an interplay between the two? Are on-site and off-site content efforts independent (are they unique, or repurposed, or rewritten for different mediums)? Are we noticing any trends or changes between the two in a way that might inform future content efforts for positive business growth? There is just as much art to analytics as there is science. You and your teams need to be creative in translating your data into actionable insights for your business. Don’t get stuck in a rut of churning the same old data over and over again. 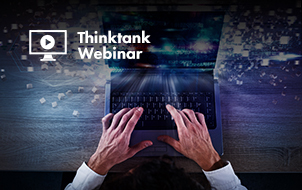 Challenge yourself and your team to think differently about your data and how you can apply your data insights in different ways. Are you planning to regurgitate numbers in each report/update, or is there a new story that can be told? Could one seemingly random finding or data point inform a totally different content area or strategy? For example, which pages are spiking in traffic referrals the most and why? Should you focus your content calendar on those specific pages? Are there insights on those pages that might trigger a new way of thinking, or represent something that truly resonates with your audience? How will you get creative and turn your ideas and findings into content marketing gold? Remember that data, KPIs, and metrics are useful only when you apply insight and take action. Your insights show you where a problem or opportunity might exist, and only when you take action will you solve that problem or seize the opportunity. Are your goals and metrics actionable? When the data changes positively or negatively, will you be able to make changes in a timely manner? Do the actions for this metric take a day, a week, a month, or even as long as a year to address? How will this impact your expectations for increasing success? Who controls the action? Is it you, your IT team, your legal department, or another entity that will have a significant or final say in taking the proper action or implementation? Plain, old-fashioned common sense will help guide you to the most viable or feasible solution. With any type of data, you will most often find short-term, medium-term, and long-term issues. And those require an appropriate solution as it relates to your own business situation and resources. Have you mapped appropriate business goals to the desired actions? Do you have performance expectations for brand KPIs? Do you have the right tools in place to track your desired measurements? Are you chasing the wrong metrics & KPIs? It’s important to see the big picture for your website and overall content performance. But measure the details, too! After all, looking closely at the “weeds” can tell you how much traffic/interest a particular page or keyword idea is generating and whether it’s a good idea worth pursuing further. Detailed data can also serve as a radar for identifying emerging trends as they happen. 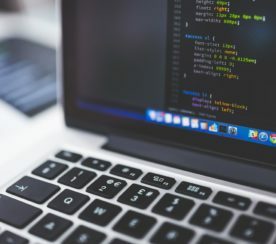 Analyzing your data down to the URL level can indicate how well your content efforts are resonating, especially when those page-level efforts are reasonably extrapolated to wider sections and themes of your digital assets. What do the “small” data points tell us about the big picture? One example might involve identifying new pages making gains, and what that means for overall resonance of your main content pillars. What do the small things mean? They might be nothing at all, but they also might lead to a bigger idea in the way of a new content pillar or messaging that resonates with the audience. 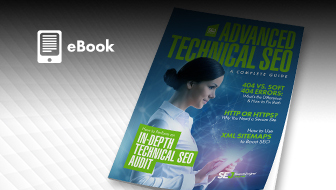 This may be something that exists on your site (a page, a section of your website, a keyword phrase, an entire keyword theme) or a content or technical implementation. Once your event is marked, you can hone in and measure all the data in the form of search traffic and social engagement. As you create successful events that produce a positive return on investment (ROI), reinvest and replicate those events that align with your business goals. What new content event did we create? Is this an isolated content event (pushing out 50 new pages), or is it connected to other marketing endeavors (three pages pushed out to support a Super Bowl commercial or another traditional marketing effort)? Are all of the new content events a result of your work, user-generated work, or content from another area of your business? One of the worst sins of modern marketing is thinking of people as data points. This might involve cornering a person into a spreadsheet as a unique visitor, a keyword referral, or other traffic stat. It’s important to remember that those data points are actually people. In many cases, they have a search intent or a problem they are trying to solve. This is often a problem in the way analytics providers are set up. But the good news is that some providers are trying to tell you more about who your audience really is. Try to look for the person, the user experience, or the thinking behind the data. Who is the person creating the data you are viewing? How does your data map back to personas, market research, or other audience insights? Does it reinforce or challenge your findings in your audience assessments? What does your audience ask for in your data? Does your content satisfy those questions with a proper answer? If not, should you revise or add more content? For all the talk about analytics and measurement in the digital world, there is no greater tool than your brain. Your brain contains the key link to interpreting data into actionable insights and is the connective element between your business intelligence, goals, execution, and data. Is your brain up for the challenge to constantly seek new insights to inform and optimize your content marketing strategy? How many brains do you need to really address the scale of your data set in a meaningful way? Are the brains doing the analysis equipped with the proper experience and insight into the areas they are tasked with measuring? How creative are your marketing minds? How analytical are your marketing minds? How well do your marketing minds balance between the creative and analytical sides of their brain? Are you really thinking about the data and applying insights? Are you constantly asking “why” about your data, KPIs, and metrics? Avinash Kaushik, an analytics evangelist for Google, is considered one of the world’s leading authorities for proper analytics strategy and management. Just as your brain is the most important tool of all, Kaushik recommends spending 10 percent of your analytics budget on tools and 90 percent on the brains you will need to make sense of it. Even if you believe your expensive and shiny new analytics widget is the best thing ever, you won’t be able to use and interpret it properly without the right amount of brain power to translate it into business intelligence. Are you over-invested in tools and analytics packages when compared to the number of smart minds needed to tell the deeper story about your content marketing program? 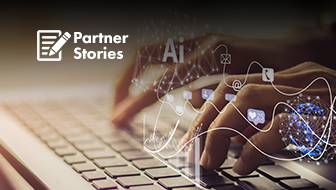 Are you under-invested in putting good brains on the data in order to solve your most challenging content problems and discover new opportunities? Be sure to spread your findings to other parts of your organization. In some cases, you might not have the direct knowledge to properly interpret the data, so forwarding it to someone with more specific knowledge can help turn the data into actionable insight. Consider forwarding relevant data to product managers, sales associates, customer service representatives, hiring organizations within your company, and your IT and creative teams, among many others. Are the right people getting the data in order to take the appropriate action? How frequently should you review data with various parts of your organization (not every stakeholder needs all the data and insights, all the time)? The amount of stress put on your organization. How much time might be lost if you go chasing the wrong metric. As you prioritize your metrics, make sure you strike a realistic balance between the juice you’re going to get versus how hard you have to squeeze to get it. This is the difference between focusing on the right areas and going off on a tangent that yields no positive results. What is the purpose of the KPI or metric? Content marketing measurement can be complex. It takes a lot of time and patience to build the big picture view for your business, as well as a real-time view. Because you will be dealing with data points from varying sources, it’s important to approach analytics with the right balance of effort and insight. A problem often occurs when marketers or business owners get overly obsessed with a signal data point, to the extent that all resources are focused on a problem or solution that is not proportionally important to your overall goals. Bottom line: if you’re generating a positive ROI for your spend using either direct response or branding metrics, then you’re generally in a good place, especially when compared to many other forms of advertising and marketing. Don’t take away from resources in content production, social media management, or search optimization in order to go chasing ghosts. Focus on what is real and on generating positive ROI, and keep reinvesting in those areas. Is your team getting worn out from chasing a metric that is unattainable based on lack of tools or lack of knowledge from a key stakeholder (example, trying too hard to tie website traffic to in-store foot traffic, if the proper tools are not in place)? Are a disproportionate number of resources being expended to chase a metric that has little or no impact on the big picture or bottom line business goals? Is the obsession taking away from more important and more “doable” efforts that will tie-in more directly to business goals? One of the biggest pitfalls of analyzing the benefits of search, social, and content is when business owners and marketers try to apply direct-response metrics to branding. If you are trying to measure branding goals by the same standards as direct monetary return, then you are doing it wrong (that is, unless you have strict monetary values applied to each branding goal and action). Not all branding goals should have a monetary value assigned. These goals are more qualitative. Branding is one of the largest untapped areas in all of content marketing. Marketers are obsessed with the online channel as a direct-response medium, while largely saving their brand budget for more traditional areas like the aforementioned TV, radio, and print. By doing so, they have ignored the massive exposure that can be obtained in online channels, beyond banner ads and rich ad placements. “Traditional” branding ad platforms of the future – even in TV, radio, and print – will be run by a robust technology company like Google, Microsoft, Facebook, or even Apple. But before we get there, marketers will need to change their perceptions about direct response and digital branding. As you begin to establish metrics, be careful of the goals you assign to different directives. If you aren’t fair in your comparisons or expectations, then you will essentially be holding back your content marketing strategy from ever performing as well as it could. What is the purpose of tying performance into areas like traffic or impressions? If you are seeking performance metrics on branding goals, do you know the lifetime value of your customer? What is a lead worth to you, in actual dollars? Do you have specific and proven numbers in place for paid display or branding media, in terms of how much you want to pay for a particular action? How would that spending (which is a bona fide statement on how much your company is willing to pay) translate to your brand goals for earned media, and more specifically, interactions and consumption of content? 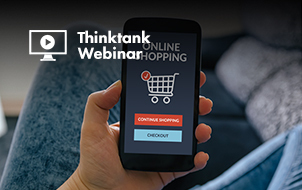 Whether you’re setting your metrics and KPIs for brand business goals, transactional goals, or something more complex and in-between, it’s important to think carefully and critically before making them a firm part of your measurement strategy. Take one – or take all – of these considerations, and you will find yourself getting much more from your content marketing program than you are now. Use these tips and revisit them periodically to ensure you are getting the most out of your content marketing program efforts. 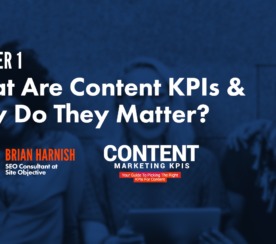 Previous ChapterWhat Are Content KPIs & Why Do They Matter?